Just 5 minutes away from the chaotic Plaza de Callao, there is a bookshop where you will feel like Belle the first time she got into Beast’s library. Librería Bardón is a must for collectors of ancient and rare books. Founded in 1947 by Luis Bardón López (1897- 1964) it’s located at Plaza de San Martín, next to the “Monasterio de las Descalzas Reales”, and since its beginnings it’s been called “Library for bibliophiles”. Nowadays, it’s the antiquarian bookshop of reference in Spain. And their purpose has remained unchanged throughout these 60 years: to find, keep and sell fine, rare, out-of-print books from XIV to XIX century. Currently they have about fifty thousand copies. Half of them are distributed throughout the original shelves, covering every wall of the shop. Their specialty are early editions, from “incunabula” (books published since the invention of printing to the early XVI century) up to copies of the XVIII century. 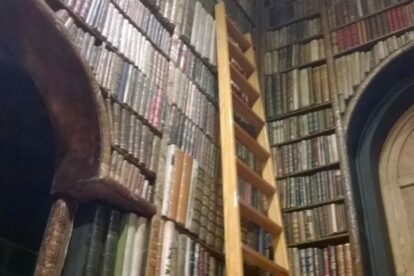 So if you feel like traveling in time, and immersing yourself in this amazing library, don’t hesitate to visit Librería Bardón. And if you are an antique book collector, Belén and Alicia Bardón, the founder’s granddaughters, will help you with everything you need.